Will Pakistan ever become polio free? And why have repeated polio campaigns resulted in poor routine immunisation drives? In Pakistan, polio cases have decreased by over 99pc since 1988, from an estimated 350,000 cases then, to 54 in 2015, and 19 reported in 2016. With the last population census conducted in 1998, the hurdles in estimating the number of children requiring vaccinations are significant. Oftentimes, while walking through the streets of Pakistan’s cities, small towns or villages, one comes across a man or woman dragging a limp leg or foot, or a shrunken arm hanging loosely by the side. Some are permanently incapacitated; others may have struggled through a lifetime of trials and tribulations to attain a place in society. Their untold challenges have taken up a new perspective ever since Pakistan attained the dubious distinction of being the last bastion of the poliovirus. 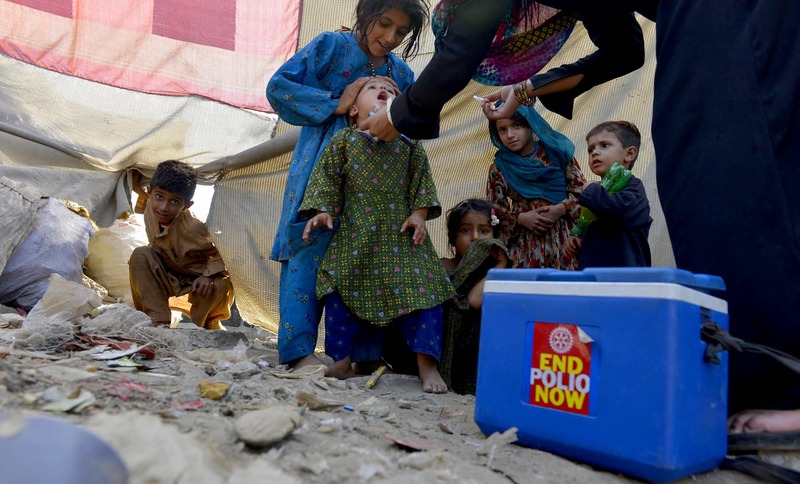 However, Pakistan’s polio eradication programme has come under international scrutiny given its position as the main driver for curtailing the global wild poliovirus spread in recent years. Being one of the biggest partnerships at the global level, the polio eradication initiative faces several challenges on the ground. Most importantly, the last population census was conducted 19 years ago; hence there are continuous and significant hurdles in estimating the number of children requiring vaccinations. This affects proper planning and resource allocation for immunisation activities. If there are no proper targets, then, it becomes impossible to assess whether the reported coverage reflects the actual number of children needed to be reached in a geographic area. To add, financial and organisational deficits, as well as conflict and insecurity have contributed to the persistent failure of immunisation campaigns countrywide. Poliovirus causes disease only in humans, and affects vulnerable children. It spreads person to person via fingers carrying contaminated faeces. Once it enters the body, it multiplies inside the gut. Two to three weeks later, the child gets a fever, headache, sore throat, vomiting and abdominal pain — symptoms that resemble a nonspecific acute viral infection. The diagnosis may go unrecognised, or it can be made precisely if specimens are sent to a special laboratory for isolation of the virus from the throat or faeces, or through a specific blood test. This is normally not required, as 95pc of children recover completely within a week or two, and there may not be need to confirm a diagnosis of what seems like an innocuous self-limiting viral infection. The recovered child, however, continues to excrete the virus from the throat and in the stool for at least several weeks to months, and can infect food and water in unsanitary conditions, thus perpetuating the infection. Five per cent of children, however, do not recover; rather, they progress to viral meningitis, and may recover slowly. The unfortunate 0.1pc of all polio victims develop paralysis over one to two days, affecting different groups of limb muscles. The paralysis is irreversible, and the child grows into adulthood with permanent loss of limb function. Others may suffer even more severe involvement of the nervous system, and can die from polio. Historically, polio has been known to cause outbreaks in many countries, resulting in disability among children and young adults. Treatment modalities were mainly anecdotal, ranging from herbs and serums to hydrotherapy and physiotherapy to kill pain, and even placing critically ill patients in the Iron Lung for months to years to help them breathe. Obviously nothing worked, until the day dawned on vaccine development for prevention of the disease. In the mid 1950s, two scientists, Jonas Salk and Albert Sabin, developed the polio vaccine. Salk developed the inactivated poliovirus vaccine (IPV), consisting of an injected dose of killed poliovirus; Sabin developed an oral polio vaccine (OPV) using live but weakened (attenuated) virus. Both vaccines have their advantages and fallbacks, but IPV alone has been extremely successful in eradicating poliovirus in developed countries. OPV, used in developing countries, has also proven effective in inducing protection against poliovirus, although some children may fail to develop immunity. Sequential administration of OPV and IPV has led to almost complete eradication of this once dreadful disease. In January this year, Sindh Chief Minister, Syed Murad Ali Shah admitted that eradicating the poliovirus was a major challenge for his government. The question is why repeated polio campaigns have resulted in poor routine immunisation drives. If one examines the results of the Sindh immunisation campaign launched in September and December 2016, the target was set at 2.2 million children in Karachi and 6.1m in the rural areas of the province. But in the city, around 2.6pc of all children were unavailable at the time of immunisation, while parents of 1.7pc refused the vaccine. Several mitigating factors have created serious inequities in immunisation coverage countrywide. Because polio eradication is mistakenly seen as the responsibility of the Expanded Program on Immunisation (EPI), polio campaigns are perceived as health department initiatives. However, given an inadequate health infrastructure and service delivery system, and lack of inter and intra provincial collaboration and coordination within various health programs, it is not surprisingly, then, that a low uptake of vaccinations among children less than five years age has been consistently recorded. Possibilities of using multiple polio campaigns to push forward the routine agenda have not been adequately explored. Polio teams visiting households can collect dropout and defaulter data and share the latter with local vaccinators. In subsequent visits, they must follow up and check up on how many defaulters have been covered by vaccinators. This would prove an excellent data source to assist health management task forces to track outreach vaccination activity without needing any extra resources. Creating sustained community ownership works, as proven in Bangladesh and India where communities took to the streets to advocate for polio eradication programs and supported service delivery. In Pakistan, families are mostly ‘reactive’ and not ‘proactive.’ So the community might know that polio drops are beneficial, but how many child caretakers actively seek immunisation for their children — especially in low-income neighbourhoods when vaccination teams do not come to their doorstep. So, despite massive funding, the question arises: how effective are current social mobilisation campaigns in changing behaviour and thinking? Lady health workers can be brought on board to educate communities on the importance of vaccinating their children. Also, the role of community service organisations (CSOs) active in areas where the health infrastructure is practically nonexistent is a significant factor if the poliovirus is to be eradicated with success in rural Sindh, Khyber Pakhtunkhwa and Balochistan. These are the areas where pockets of missed children are also expected to be found. CSOs also need to be involved at provincial, district and sub-district levels from the planning phase. This would also provide much needed additional resources for the government in short supply of vaccinators. If CSOs are given this responsibility, and then held accountable to ensure that their areas are covered during polio campaigns and during routine immunisation, the chances of identifying children who might have been missed increases. Pakistan must save its children. It must make its last ditch effort to achieve the goal of becoming a polio-free nation in 2017, and celebrate the end of the era of the poliovirus with the world two years after the last case is detected. The world’s eyes are set on Pakistan. Click on the tab to the right to find out what it will take for Pakistan to become polio free. NEAR THE FINISH LINE: WHAT WILL IT TAKE TO GET THERE? Although countrywide efforts to eradicate the poliovirus began over two decades ago, Pakistan still lags behind because of various factors — including the poor performance of vaccinators, community reluctance towards immunisation and missing children who remain unvaccinated because of frequent migratory movement. In pursuit of zero polio cases, the Sindh government, for instance, must muster resources and political will in order to face the daunting challenge of eradicating the virus. Renewed commitment to make the province polio free follows similar attempts in the past. That said, despite failing to meet the national polio eradication deadline set for December 2016 (the country would have not reported a single case), government authorities remain confident the National Emergency Action Plan 2016/2017 to stop the transmission in core reservoirs and maintain or increase immunity against polio is well-tailored. Dr Rana Muhammad Safdar, national coordinator of the Emergency Operation Centre (EOC), tells Dawn that the government has improved immunisation coverage in the past two years, evident in the numbers of decreasing cases. In spite of these developments, why Pakistan is the single greatest challenge to global eradication is a difficult question. He admits that these efforts were not enough to eradicate the poliovirus last year. The virus remains active in the Khyber-Peshawar corridor, Karachi and Quetta block — all serve as core reservoirs that have held the infection for years. Further, in 2015, the detection of the virus from environmental samples in low risk areas indicates that under immunised children are allowing it to spread and survive. When 306 poliovirus cases were reported in 2014 – the highest national annual aggregate of the decade — international health regulators imposed travelling restrictions on Pakistanis, compelling them to possess vaccination certificates. This will be lifted only when Pakistan is removed from the list of endemic countries, which includes Afghanistan and Nigeria. Dr Safdar explains this will happen when the country does not register a single polio case for one year and also show negative environmental samples. Two more years with the same scorecard are then required to become a polio-free country. In the case of Nigeria, it remained polio free for a year but, when the virus resurfaced the following year, it was placed back on the list of endemic countries. As countries that face extremism and terrorism, all three — Pakistan, Afghanistan and Nigeria – are bracketed as locations where the poliovirus is endemic. Such is not case with India and Bangladesh, both successfully polio free. The ban on polio vaccinations by the Tehreek-i-Taliban Pakistan in North and South Waziristan in an effort to halt drone attacks in 2012 further halted the programme. Resultantly, Fata recorded 179 cases in 2014. This figure decreased to 16 in 2015 and only two cases were reported in 2016 — military action to cleanse Fata of militancy is partially attributed to this improvement once vaccinators were allowed to reach children in Fata and Balochistan. “Currently, we are reaching our target of vaccinating one million children due to support from the army,” Dr Ikhtiar Ali, Fata’s head of the Expanded Programme on Immunisation (EPI), tells Dawn. When the interim government took over in March 2013 before the general election that year, the polio programme countrywide was set back, say officials, because of lack of political will. It took a while for the PML-N government to acknowledge the significance of polio eradication – and that happened at the tail end of 2014. Under such circumstances, the polio eradication programme, especially in Khyber Pakhtunkhwa was set back by almost four years (2012-1014). “The security situation has seriously affected the polio effort. Before the military operation [Zarb-i-Azb in 2014] in North Waziristan, it was impossible to reach 300,000 children in Fata. Also, because of growing militancy, volunteers were unable to vaccinate 270,000 children in certain parts of Karachi, particularly Gadap Town. Now, with law-enforcing institutions helping us reach targeted children, we hope to make progress,” says Mr Safdar. Currently, widespread circulation of the poliovirus in 13 districts, including 6 districts in KP, 5 in Sindh and one each in Fata and Balochistan remains a major challenge. When increased districts report cases, it becomes difficult to stop the virus from circulating. Such a scenario needs innovative approaches — including community-based vaccinations, and a high risk mobile population strategy to ensure that children on the move with families are vaccinated. Moreover, as the virus continuously appears in environmental surveillance sites from Multan to Peshawar, indicating its ability to circulate, it becomes challenging to speed up eradication. The programme has a network of 200,000 Sehat Muhafiz workers from local communities, trained to motivate families around polio immunisation activities. These networks must be made accountable to track and immunise children, newcomers included. According to Dr Imtiaz Ali Shah, in charge of the polio eradication drive in KP, the number of polio cases recorded in 2016 are the lowest in the history of the 22-year eradication programme in Pakistan. Furthermore, 36pc of samples tested positive for the poliovirus in 2014 surveys, which were reduced to 20pc last year and 10pc this year. Besides, the genetic diversity of the poliovirus has reduced phenomenally, which means it is ‘dying,’ Dr Shah says. Independent monitoring sources argue this doesn’t mean that Pakistan has successfully eradicated the poliovirus. Take the example of blind spots at the border with Afghanistan that have long been of concern when one refers to transmission. Cases have shown that the virus was transported from Afghanistan to Fata and KP. At the national level, the KP eradication programme places emphasis on disease surveillance. The province has spent Rs1.5 billion from its resources since 2012 and established a security coordination committee under the province’s Home Secretary [with members from the army and law-enforcement agencies] ensuring security for vaccinators visiting communities to convert refusal families and create a demand for vaccines. About 25,000 security personnel are deployed with vaccinators during monthly drives, for instance. KP is the only province that has sanctioned a position for a polio coordinator for the EOC. In other provinces, the posts were held as an additional assignment by the officer concerned. However, the socio-political environment and healthcare capacity of the country determines the effectiveness of public health programs. “Engaging religious leaders have helped in the reduction of refusals and change perception,” the Director-General for Health Services in KP, Dr Said Ali Khan says, adding that refusals have decreased from over 30,000 to less than 3,000. Refusals on the basis of religious beliefs were approximately 70pc of the total refusals previously. This proportion has dropped to less than 45pc. The first three months of 2017 are crucial in Sindh, with more polio eradication campaigns planned in January and the targeting of areas which were earlier declared polio free but have reported new cases of late. Areas have been mapped where inactivated polio vaccines (IPV) will be administered to children. Officials say children who have previously been inoculated with oral vaccines (three times at least) and have less immunity because of malnutrition could be saved from this crippling disease with IPV. Meanwhile, the new surveillance technology bag-mediated filtration system (a device used to detect the virus in fluid) has reduced the number of missed children who were uncovered by vaccination campaigns. In 2015, 75pc of those missed children were vaccinated, but that improved to 96pc in 2016. Third party monitoring has made the campaign reliable. More than 3 million children are set to be inoculated with the inactivated poliovirus vaccine in southern districts of Sindh (where fresh cases have surfaced in 2016), Peshawar, KP and South Waziristan. Another setback impacting the anti-polio campaign, especially in Karachi, have been attacks on volunteers that started in December 2012. 15 attacks were reported in 2013, 25 in 2014, five in 2015 and two in 2016. The recent decreases indicates improved security, though attacks definitely affected the campaign, says Dr Safdar. 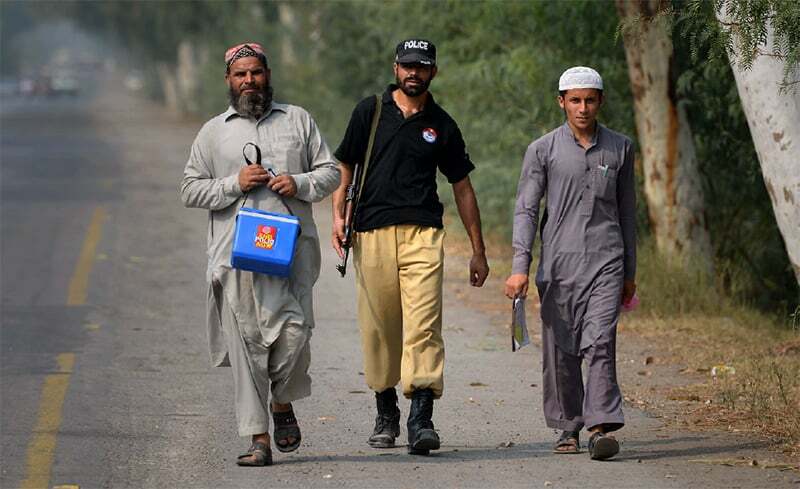 During recent vaccination drives, 5,000 policemen patrolled and cordoned off neighbourhoods, making it easier for volunteers to work without fear of militant attacks. The last time a polio case was recorded in Karachi was in February 2016. Fayaz Jatoi, coordinator for Sindh’s polio operations, claims stopping polio transmission has managed to halt the circulation of the virus in traditional challenging reservoirs. “The programme has seen dramatic reductions in the numbers of cases from previous years, while environment samples in Sindh have been negative for consecutive months,” he adds. Click on the tab to the right to find out what impediments Pakistan faces. In December 2015, when Zarina was two-years-old, she developed a fever and was diagnosed with the poliovirus. “Doctors told us that her left arm and lower limbs were affected by the virus,” Haji Khan, her 58-year-old grandfather says. He has come to Karachi from Quetta, where he worked as a farmer. Unable to cultivate his ancestral land due to water shortages, he was compelled to move. Presently, living with his son, Daulat Khan – Zarina’s father – in Islam Nagar, a slum settlement in Karachi’s Baldia Town, the family continues to visit their native village. Officials from the polio immunisation team claim that she was administered at least seven polio boosters, including one during the routine campaign and six during special immunisation drives, but say she contracted the virus during her visit to Quetta. Despite immunisation programmes initiated by the government and international donors, Pakistan is not yet polio free — and the reasons for this are manifold. Healthcare experts say the barriers include the lack of quality vaccinations and the mishandling of the anti-polio vaccine by eradication teams. Community refusals are also cited as a challenge. However, climate change and worsening environmental conditions are critical factors impeding the polio eradication drive. Just like Haji Khan from Quetta, there are many hundreds who have migrated to cities because of the mitigating effects of climate change, including the reduction of water sources. Severe and frequent droughts, due to the change in weather patterns, has adversely affected arid regions of Sindh like the Thar Desert, Kachho and Kohistan, forcing many families to migrate. Similarly, in Balochistan, also vulnerable to droughts – and away from the monsoonal path – agriculture is dependent either on rainfall or on ground water. Both are fast running out. The southern districts of the province have been hit hard, resulting in mass-scale migration from these areas — an exodus rarely reported by mainstream media. In Northern Sindh and certain districts of southern Punjab, depleting agricultural resources and increasing poverty due to environmental degradation has also caused displacement. Most migrants travel to urban cities hoping for gainful employment — and Karachi, the country’s commercial magnet, attracts large numbers of unskilled and poor workers. Without homes and jobs, they are compelled to live in slum settlements without basic sanitation and clean drinking water. According to the Sindh Katchi Abadi Authority, there are 564 slums in Karachi, majority of which are located on drains and nullahs that are supposed to carry rainwater, but are presently a conduit for reams of raw sewage. Because the poliovirus is carried in human faeces, sewage is an ideal place to look for the virus and can be used to track the infection in a population. Moosa Colony in Karachi’s Gulberg Town is one of such slums where most of the houses are built right on the Gujjar nullah, a large natural drain that carries raw sewage and passes between the houses. Barefooted, young children sitting on the edge of nullah mould toys with mud while some enthusiastically fly kites. Others enjoy jumping on a trampoline. Slums dwellers, including children, inhale raw sewage all the time, and when it rains, their makeshift homes fill with manure. “The poliovirus travels through the sewerage. In Karachi, slums located on drains pose major hurdles when it comes to eradicating the poliovirus from the city [and is also] one of the reasons why Pakistan is not polio free,” explains the former president of the Pakistan Pediatric Association, Dr Iqbal Memon. And, because these scattered slum settlements are not provided with basic facilities by the municipality, including drinking water connections, they must get water through pipes, which mostly pass through these drains, therefore mixing sewerage with water. “Even if the virus is not mixed with the water they drink, these children are at the risk because they play beside the drain and are susceptible to the poliovirus,” says Dr Memon. Around 13.5 kilometres in length, Gujjar nullah begins from Sector 11 in North Karachi, cuts through different towns, and merges with the Lyari River near Golimar area before draining into the Arabian Sea. On the way, several small and big drains bringing raw sewage from different areas meet Gujjar nullah, swelling its size. Therefore, if a child diagnosed with polio or even an adult becomes a carrier and brings the virus from an effected area to any of these locations, the virus will enter the drain and threaten children living near these drains. However, those working officially on polio eradication projects do not agree with this. The head of the National Emergency Operation Centre for polio, Dr Rana Safdar, confirms that the virus travels through the faeces of an infected child or the adult who is a carrier, but it will not affect the slum settlements living near the drains. “There are not too many infected children so even if virus enters the drain through the faeces, so is the vaccine, as we vaccinate all children. If the vaccine too goes through their faeces into the drains, when both the virus and vaccine meet, the latter starts working in the drain and destroys the virus,” said Dr Rana. On his part, Dr Memon agrees but says that it depends on the quantity of the virus and the vaccine. The various drains found in Karachi are supposed to be the reservoirs of the poliovirus. Ecologist with the International Union for Conservation of Nature, Nadeem Mirbahar does not agreed with Dr Rana Safdar. He says the drains are reservoirs for the poliovirus, and even if the vaccine works inside these drains they are inundated with heaps of garbage. This implies the spores of the virus will fly in the air, making surrounding children vulnerable. He said that, since slum dwellers are poor and their children are malnourished, poor environmental conditions expose them to the virus. However, the polio coordinator for Sindh, Fayaz Jatoi, says all environmental samples collected in Karachi since August 2016 tested negative. When asked about the type of virus discovered in two recently reported cases from Karachi’s Gadap Town, he said that an aggressive vaccination campaign had forced the virus to move to areas where the immunity among children is very low. For her part, Bibi Khaldia Nasreen, a supervisor of polio teams in Orangi Town, says she’s worried about slum children contracting the poliovirus because of poor sanitation. “The government does not provide basic facilities such as proper sanitation and mostly children defecate in the open, so there are more chances that they can contract the diseases easily because the polio virus travels through faeces,” she said. Unless the mindset of people (especially some mullahs) changes, this virus cant be eradicated and poor children will suffer. Hats off to the workers and security forces working to vaccine every child and make Oakustan a polio free country. They deserve the Nobel peace prize. 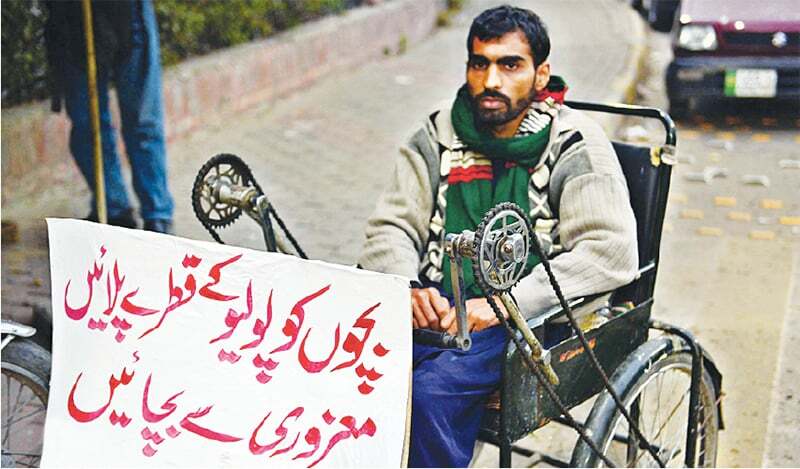 Wish the Government supports them in the fight against polio . All South Asian countries should come together to eradicate this evil named Polio. This is a bane which can be easily defeated when fought together. @Saroj Polio has already been eradicated in many South Asian countries including India. Good Luck Pakistan. Let us know if any help required. Not anytime soon as long as the government's priorities are elsewhere - in flashy, vote-grabbing motorways and metros financed by crippling debts. In Pakistan, polio workers who go door to door risk life and limb for a pittance, and are viewed upon with suspicion at best and outright violence at worst. My salute to them, but it's thankless, undervalued work.